The Hausted® Patient Handling Business (“Hausted”) is a leading developer and manufacturer of state-of-the-art, specialized patient handling systems for a wide variety of health care applications. Hausted’s primary products include stretchers and chairs utilized in emergency rooms and operating rooms of hospitals. Hausted was a wholly-owned business unit within STERIS Corporation, a publicly-held company (NYSE: STE) with 2009 revenues in excess of $1.29 billion. MelCap Partners acted as the sell side advisor to Hausted. 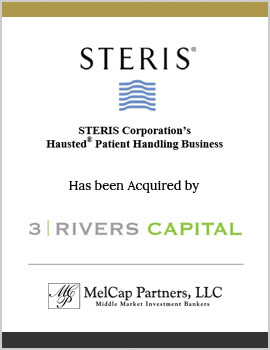 Hausted was successfully sold to 3 Rivers Capital.